im back for more CRs from the fresh side. Was suppose to wake up before first light but end up slept till 9am. So finding kaki and got one interested. So off we went. Our target of the day was the elusive toman. We were casting for 15 mins, then i felt a tug. i struck and tried to set hook. Fish on! fought for awhile on light setup and landed this beauty. My friend was green with envy, he took out his flatrap and starting twitching like mad! haha and BAM! A humphead PB! i wasnt still satisfied as i went to change to rattlin rapala to make commotion. So i casted, and casted, and a huge toman struck my lure. And the hook came off after it did its acrobatic jump! i tried again, only to lose my lure which got stuck. i shall have my revenge soon. Hopefully. hope u guys enjoyed my CR, All fish CnR. Thanks for reading. 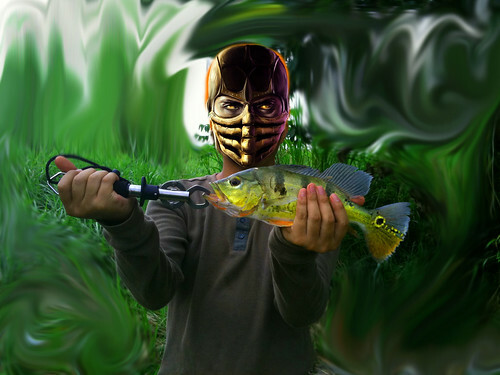 Interesting catch report, that's some neat photoshop work concealing yourself. A pity the toman got away, but such is fishing. You win some, you lose some. Great catch on the peacock bass. nice photoshop! but i recognise the stone! muahaha. 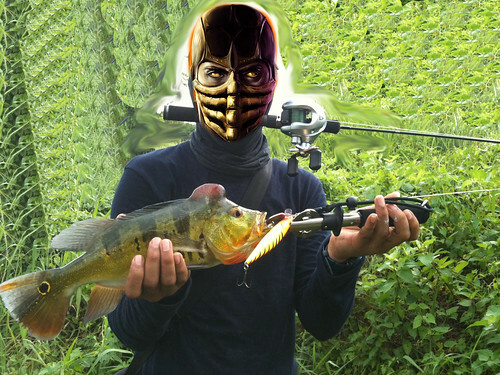 Peace wrote: Interesting catch report, that's some neat photoshop work concealing yourself. A pity the toman got away, but such is fishing. You win some, you lose some. Great catch on the peacock bass. i have to conceal. Preservation of species. Sooner or later, spot gone, no more playgrnd for me. QTfisher wrote: nice photoshop! but i recognise the stone! muahaha. Well all i can say if u really know where i was luring at or if u do fish or lure there. Just keep it clean and litter free. I had a hard time clearing the litter today. irresponsible anglers.